This is free jazz, for sure. However, no one among them imagine what it expected here. (...) So, whether it is all about the bird or all about jazz ultimately does not matter. In the end, it is all about the profound beauty of where music and life meet. 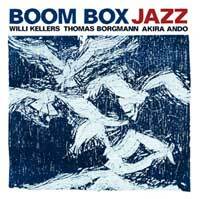 Borgmann's prophetic conversations with bassist Akira Ando and drummer Willi Kellers regarding the mighty flight of the avian being are a parallel to how music captures the downward spiral of blue sorrow and the upward spiral of the joy that follows with equal majesty and splendor. (...) Thomas Borgman is one of those rare examples of equal part musician and instrumental virtuoso. (...) Another standout on Boom Box is the fugue like proportions and dimensions of Little Birds may Fly. Like Bach (yes, that Bach) Borgman knows how to melodically set them up and knock them down with precision and invention. His task is consistently facilitated by the contrapuntal excellence of bassist Akira Ando and drummer Willi Kellers. Was there ever any question, both are forever now in The Book; ours is now to follow and listen.